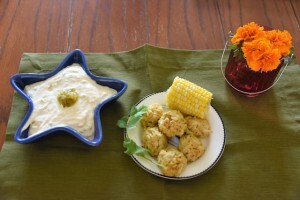 Crab Cakes, Maryland Style: What’s in your recipe? It was on a rainy afternoon in the Carpenter Street and Saloon in St. Michaels when I had my first Maryland crab cake. So when I met Ruth, and learned that she is a born and raised Baltimore transplant now living in The Woodlands, Texas, I cautiously asked if she had a favorite crab cake recipe. To my surprise she voluntarily shared her recipe with me. Her recipe is actually similar to the Crab Cake Balls recipe below, so I’ve included her recipe for Crab Cake Meltaway instead. 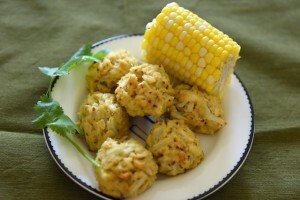 Hints from those who know: Ritz crackers add a buttery taste to the crab balls and/or cakes. Old Bay seasoning is a must ingredient. Mix all the ingredients. The mixture should be moist, not dry. Adjust, adding mayonnaise and crackers as needed. Form into balls and place on a buttered cookie sheet. Drizzle with melted butter. Bake 15 minutes at 350 degrees, until heated through or fry with a little olive oil. To make cakes, form crab mixture into desired circles. Mix all ingredients and store in refrigerator until ready to use. When frying fish, salt bottom of skillet, then the fish will not stick. To keep sandwiches from drying out, seal the edges of the wax paper with a hot iron. To keep parsley fresh, place it in a closed fruit jar in the refrigerator. Loads of crab chunks, a minimal amount of filler-make this recipe a crab lovers’ dream. Several hours before serving, mix crab with old bay seasoning. Refrigerate. Mix crab meat with mayonnaise, cracker crumbs and season with salt and pepper. Add vinegar to melted butter. Set aside. Gently form 4 (1/2 lb. each) tennis sized balls of crab mixture. Place in heat proof baking receptacle. Pour the melted butter/vinegar mixture over the crab meat. Sides: serve with corn, mashed potatoes, green beans, macaroni salad and, my favorite, coleslaw. Add tartar sauce on the side for dipping. Thoughts from the 60s: The man wears the pants in the family, but the woman provides the suspenders. A community is not made of the number of square miles it contains, but by the number of square people it contains. The head begins to swell when the mind stops growing. J.L. BRANDT & Son, Inc.
Slice muffins in half. In small bowl, mix remaining ingredients. Spread mixture on muffin halves and place on a cookie sheet. Freeze until firm-at least thirty minutes. To store: place frozen pieces in freezer bags. Store until ready to use. For same day use: freeze for 30 minutes, then place on broiler tray and broil until light golden brown and bubbly.